Finance Costs > How Much Does a Trespassing Ticket Cost? How Much Does a Trespassing Ticket Cost? In general terms, trespassing occurs when a person knowingly enters a piece of property that is not his or her own and remains there despite having been requested to leave by the legal occupant/owner. A trespassing offense can also be associated with a criminal violation such as harassment, stalking, a violation of a restraining order, disorderly conduct, loitering, electronic encroaching or hacking, and other forms of offenses. In general, if you see a sign warning you to not trespass and you decide to ignore it, then you will be charged with criminal trespassing if caught. Because of these broadly applied statutes, you might require the expertise of a legal professional to determine the extent of certain criminal trespassing cases. The cost of this fine will depend on where you live, how your trespassing is classified by the state and if an attorney is involved. On average, most trespassing tickets fines can vary anywhere from $100 to as much as $2,500+ for a misdemeanor. As for a felony, it’s not unheard of to hear fines go up to $100,000. In most cases, a criminal trespass, as long as this is the only crime involved, will be less than $500. JacksonWhite, an attorney located in Mesa, Arizona, breaks down the three offenses you may face if you were to trespass in Arizona. For example, a person who commits first-degree criminal trespassing could fast no more than six months in jail and a fine up to $2,500 for a misdemeanor. In the second degree, the fins will not exceed $750, while trespassing in the third degree will not exceed $500. These fines will ultimately be based on your criminal record and the judge. A lawyer on Avvo.com answered this question and stated the fines can range from $50 for a class three misdemeanor to as much as $100,000 for a first class criminal trespass, which is deemed a class five felony. According to CriminalDefenseLawyer.com, trespassing fines can vary from a few hundred dollars to as much as $4,000 or more. Depending on the state, most trespassing offenses will be classified as a first, second or third degree, with the first, as with every crime, being the most extreme. 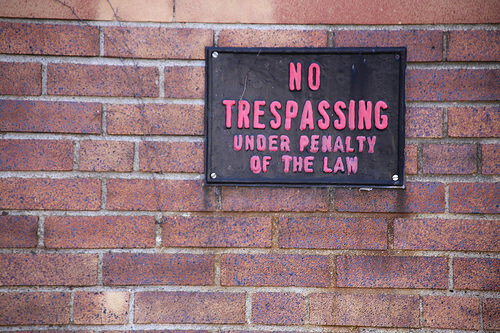 A first-degree crime of trespassing, in general, refers to the act where a person knowingly and unlawfully enters and/or remains in a building, real property or inhabitable structure of another person. A trespassing ticket can involve time in jail, again, depending on the circumstances and where you live. While jail time is rare for simply trespassing, it can be considered if it were connected with another crime. In most cases, courts won’t impose jail penalties, fines or even lengthy probation periods, but this isn’t always true as it can vary from person to person and state to state. The estimates mentioned above are for the court fines only and won’t include the lawyer fees if you were to hire one. On average, a lawyer could easily command $250+ per hour, with most cases taking hours of prep work and court time. Depending on your circumstances, this could be as little as a few hundred dollars to well over $10,000. Upon conviction, you will always be asked to pay the court costs, which can cost more than $100. These costs are designed to reimburse the courts and prosecutors. is trespassing a felony? This is a question that’s asked often. In general, trespassing is punishable by a misdemeanor; however, in some cases, it can be classified as a felony depending on your intent. If your intentions were to rob a house, for example, then this will be classified as a felony more than likely, whereas refusing to leave a parking lot may be classified as a misdemeanor. Your results will vary. A lawyer, in most cases, will always be a smart idea, especially if you’re facing jail time or a felony. While a lawyer may sound expensive, you have to remember these lawyers could help lower your fines, offsetting the lawyer costs, get rid of it on your record and/or even save you months out of jail. Most lawyers are more than happy to offer a free consultation, so be sure to talk with a few in your area to see if they are willing to work with your budget and case. Do I have to pay if I didn’t trespass? I was told I could get my stuff out of my exs and I found brugs so I got a ticket for trespassing. Cliff jumping on boyscout property for a school project. Worth.